You may begin every day in the same way: dress for work, eat a delicious breakfast, brush your teeth, and head out your front door. Eating before a big day at work or school is important, however, many people don’t know how to properly brush their teeth after consuming their breakfast. Acidic drinks, such as sodas and fruit juices are notorious for damaging your teeth in the long run. But how? 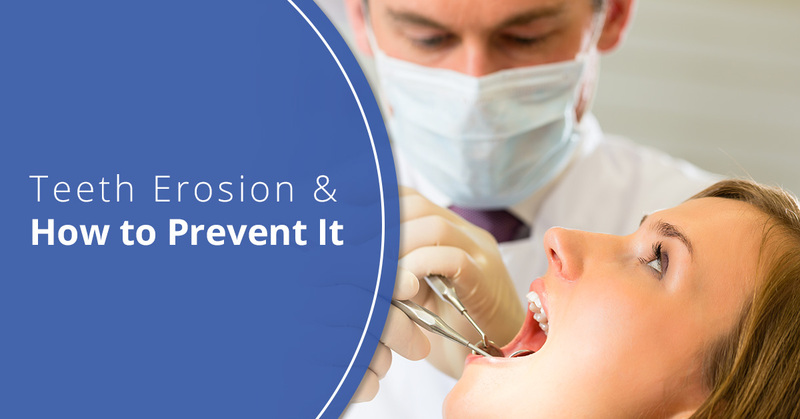 In this blog, we will discuss the effects of dental erosion and how to prevent it from happening to you. Your teeth are vital to your life, but too often bad habits and routines damage your teeth and cause problems in the long run. By reading this blog, you will hopefully have a better understanding of teeth erosion and what actions you must take to keep your teeth looking healthy. Dental erosion is a condition where your teeth’s structure is damaged or dissolved away by chemical reactions taking place in your mouth. Over time, your teeth could be slowly corroded away by chemicals, eating away at the protective coating of your teeth commonly called the enamel. This enamel is used to guard your teeth from acids and other chemicals and ensure your teeth remain strong and resilient. However, when the enamel is fully eroded, it is permanently gone and teeth are vulnerable. Typically, erosion can be visually seen if your teeth are appearing thinner, transparent, and have small brown-colored pits on them. These are all signs that your teeth have undergone corrosion and need to be better-taken care of. Dental erosion is caused when there is an overabundance of acid in the mouth. This can be caused by drinking acidic beverages, such as soda or fruit juice. Now, these beverages don’t specifically cause erosion, however, if they are drunk constantly and not washed out with water or by brushing your teeth, the leftover acid can be problematic. For example, if you drink a glass of orange juice for breakfast, but don’t rinse out your mouth before brushing, you could leave acids on your teeth. And, because you are brushing your teeth, some of the acids can get mixed in with your toothpaste and stay inside your mouth. Erosion can also be caused by some medical conditions, such as acid reflux and bulimia. Both conditions introduce stomach acids into the mouth. Over time, this can dissolve enamel and weaken your overall teeth. With weakened teeth, you could have many oral problems. For example, if you have weak teeth you could suffer from dental cracks or tooth loss. Regardless of how the erosion is occurring, it is important that you address the problem before it leads to severe oral damage. One of the best ways to prevent erosion is to wash out your mouth before you brush your teeth. If you regularly drink fruit juices, such as orange juice, you need to make sure that you clear away any of the acid in your mouth. If you do not, the acid can be left behind in your mouth and cause erosion and plaque build up on your teeth. At Chess & Taub Family Dentistry, we strive to offer families that best pediatric dental care. Our trained staff members have years of experience and know how to communicate with younger patients. Due to the fact that children have less patience, our dentists know how to do their job well, and quickly, so that children don’t become distressed. Contact us today.